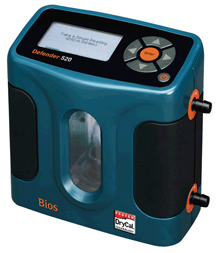 The Bios Defender 520 Calibrator has the ability to take volumetric readings, adding to the line of DryCal primary flow calibrators. Automatic correction of readings for temperature and pressure, rather than merely recording of ambient conditions is essential in many applications. The Defender 520 provides users with a true primary flow calibrator for industrial hygiene, environmental and laboratory applications. Defender primary flow meters are designed to provide light weight ultra-compact size, incorporating the industry leading DryCal technology. Building on the patented DryCal near-frictionless piston technology, the Defender 500 series incorporates features to make it immune to flow source pulsation without the need for in-line dampers. The Defender 520 is easy to use. Turn it on. Connect it to a sampling pump. Start taking readings. It's as simple as that. Calibrations within a minute with no messy soap bubble solutions to wait on or clean up. Integrated temperature sensors and pressure transducers placed directly in the flow stream for optimum standardized results. Defender 520 ±1% of reading volumetric, includes temperature and pressure recording.